The Eating & Drinking Guide is The List’s flagship annual printed guide. 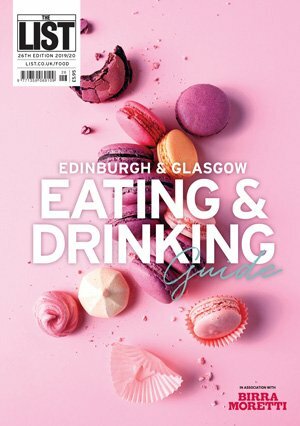 For 26 years it has been providing a comprehensive, well-informed and reliably up-to-date guide to the dining scene in Glasgow and Edinburgh – both in print and online in full at food.list.co.uk. The full-colour, 176-page print guide is published in April each year with a print run of 30,000 copies and an estimated readership of at least 200,000. It is for sale all year in principal bookshops, newsagents and other venues, as well as from our online shop. The reviews that make up the listings for the two cities are freshly researched and written in the first three months of 2019. Our team of 65-strong locally based reviewers eat out anonymously at nearly 1000 venues across both cities, including over 150 new openings since our previous edition. The reviewers are our discerning eyes, ears and palates about town, helping us keep track of the movers and shakers of the ever-evolving and constantly improving eating and drinking scene. Published in April 2019, our 26th edition combines an accessible introduction to the eating and drinking scene in each city with the detailed listings we’re famous for, offering comprehensive coverage of all the eating places worth knowing about across Edinburgh and Glasgow. In the guide you’ll find feature articles introducing different aspects of the eating and drinking scene, a run-down of good local food shops, markets and event, and our latest summary of the highlights of the two cities which is covered by our annual Awards, Hitlists of our pick of the best places to try in each different dining style covered in the guide, along with a new, 30-page Tiplist section. This feature brings together useful selections of where good things are happening in both Edinburgh and Glasgow in dozens of helpful categories, from outdoor dining and BYOB to craft beer, cocktails, coffee, bargain lunches, takeaway sandwiches and our pick of the bars and cafés to check out in different parts of both cities. All venues in the Eating & Drinking Guide can also be found online at food.list.co.uk, with each entry offering the same independent review and key factual information as well as useful additional material such as links to establishments’ own websites and social media, individual locator maps and search functions. You can keep up to date with what’s happening in the food and drink scene locally by picking up the bi-monthly List magazine, signing up to our monthly Eating & Drinking newsletter, or following @thelistmagazine on Twitter. Unlike other restaurant guides which only cover venues that have paid to be included and where review visits are prearranged and carefully orchestrated, no entry in the Eating & Drinking Guide pays to be included, none is obliged to advertise and none is given sight of its review before publication. Restaurants covered in the guide are chosen on merit and reviewed incognito – to ensure our experience is that of any other diner. Each restaurant is freshly reviewed each year by a different writer from The List’s team. Our reviewers are experienced and knowledgeable, but they’re not professional food inspectors. They’re chosen to reflect an informed local diner’s viewpoint, and they are encouraged to express an unbiased and even-handed opinion. No special favours are accorded to the companies that choose to buy display advertising space in the guide – they are treated exactly the same when it comes to their review visit, write-up and Hitlist selections.